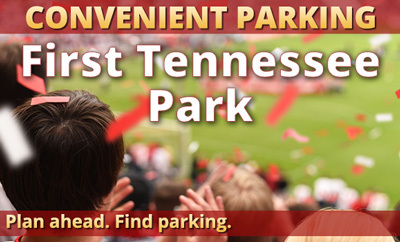 Parking.com has convenient parking for First Tennessee Park. Refer to the map for more information on parking. Plan ahead and find parking for Nashville Sounds home games and special events at First Tennessee Park. First Tennessee Park is a state-of-the-art-facility in Nashville, and home of Minor League Baseball's Nashville Sounds. When not hosting baseball games, the ballpark is used for special events such as outdoor concerts, beer tasting festivals, and soccer games.